Readers of my report on my visit to the north Aleppo town of Azaz near the border with Turkey will recall that authority in Azaz is divided between two bodies: the local council and the Shari’a committee. Broadly speaking, the local council covers the realm of public services, while the Shari’a committee, working with the Northern Storm Brigade as the police force, is responsible for criminal law and order, family and public morality. Both bodies are officially ‘civil’ (madani) and ‘independent’ (mustaqill), but in particular, the Shari’a committee’s own links with what was then the Islamic Front in Aleppo (now the Levant Front) were clear during my visit with the presence of the rebel coalition’s flags at the entrance to the building. 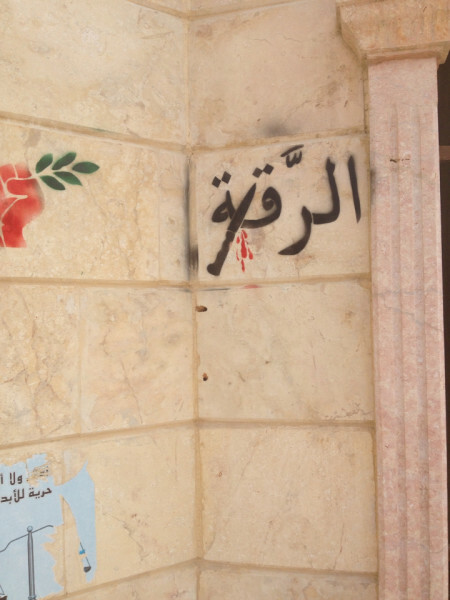 This post explores in greater detail the activities of the local council in Azaz, which is located in what used to be the regime’s local security centre that also held detained opposition activists. The local council’s funds primarily come from its own members and charging of locals for some services it provides (e.g. street cleaning). As the Syrian civil war enters into its fifth year, with so much attention on the Islamic State (IS) phenomenon and its system of administration of territories it controls (for an ongoing extensive archive of IS administrative documents, see this post on my site), one should not forget that life and governance in Syria exist beyond IS, jihadi groups and the regime. Though there is a Jabhat al-Nusra presence in the town that has a base and controls one of the mosques, it still does not exercise governing authority and thus has no presence in Azaz’s local council or Shari’a committee. An interesting notable Jabhat al-Nusra figure in Azaz who was reportedly assassinated in January this year was Shari’a cleric/judge Abu Shu’aib al-Masri, a defector from the Islamic State. Clarification statement on the activities and specialties of the local council in Azaz. 1. Cleaning/Sanitation: With all its burdens and requirements including securing fuel for the municipality’s vehicles, regular maintenance for them, and securing ‘nature of the work’ for the cleaning/sanitation workers- whose number is at 40- at a sum of 250000 Syrian pounds a month. 2. Electricity: That also through fuel for the electricity network’s mechanisms and regular maintenance for them in addition to supporting the electricity network with maintenance necessities for the town’s network as far as possible, it should be noted that we have received from the Energy Ministry real materials and necessities for the electricity network in the town of Azaz but they are insufficient on account of the accumulation of malfunctions in the network for 4 years and we have undertaken to restore the functioning of the al-Asyana network whose malfunctioning has continued for more than 3 years. 3. Education: We have begun our project on the education situation in a self-effort with the help of some of the generous families and guarantee of male and female teachers recruited from all specialties and the number of schools’ students in all study stages has reached 6500. Let it be known that the schools in the town of Azaz have been interrupted in functioning since the beginning of the revolution but Chemonics and the Syrian Promise movement have moved forward in supporting us in restoring suitable furniture for eight schools including doors, windows, fibres, heaters, and fuel to heat the schools over the course of the winter season and work is now proceeding excellently in the town. 4. Health expenditure: The local council has begun its work in maintaining some of the drainage points with very simple capabilities and we are continuing this project. 5. Water: The local council has undertaken to prepare uncovered wells and the water main in complete form and to draw water from the Midanki Dam so we are continuing to work and by all available means to prepare this project and complete it in the nearest time possible to provide water for all the town of Azaz. 6. Aid: We are now working to restructure the aid staff with areas directors and organizing the distribution operation. As for the operation to distribute milk and diapers, the local council is undertaking to verify children’s vaccination cards on account of the widespread existence of fake vaccination cards and we have undertaken to publish the names of all the beneficiaries for the distribution of milk and diapers on our page and we have asked families to help us identify the names of those not entitled. 7. As for the issue of restoring roads, the engineering office is responsible for this matter in the town in cooperation with the local council and the military office and we will undertake this project at the beginning of the spring because of the lack of possibility at the current time with the rain. 8. As for the bakery (reserve/relief), we undertake to secure aid-provided flour for the bakery through aid of some of the organizations for us and as for its functional management we have nothing to do with that at all. Municipality vehicles’ fuel: 356275 Syrian pounds. Vehicles’ maintenance: 141600 Syrian pounds. 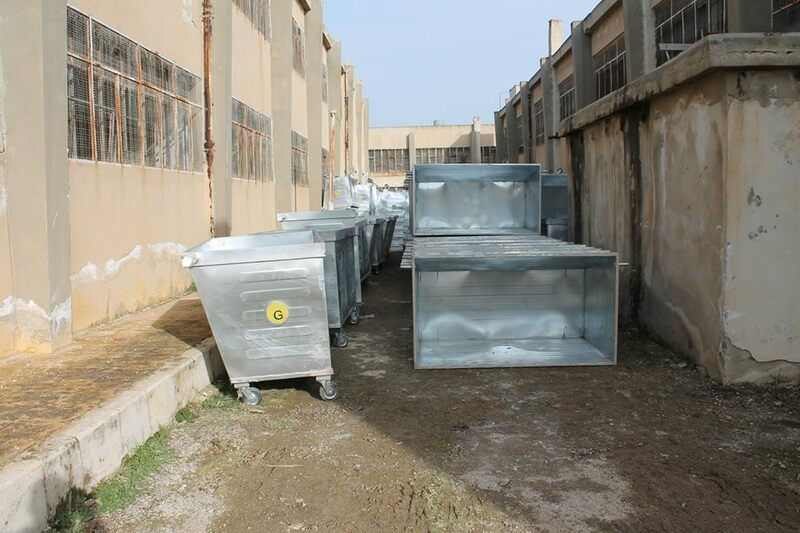 Vehicles’ frames: 60200 Syrian pounds. Oils for the vehicles’ engines: 17590 Syrian pounds. ‘Nature of the work’ for workers: 220000 Syrian pounds. Sanitation workers’ salaries: 78000 Syrian pounds. 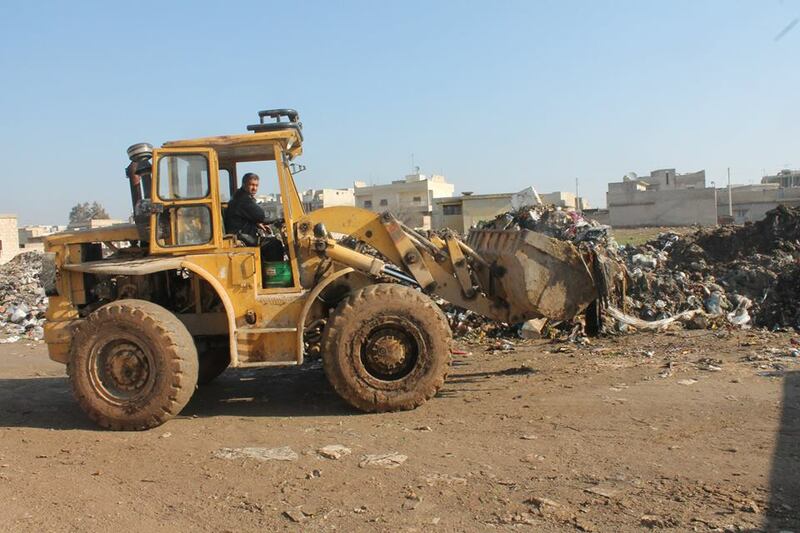 Rubbish collection in Azaz by the local council. Accumulation of piles of rubbish in the open in the town is a notable problem. Besides World Vision, the local council has also received assistance from GIZ, a German international development organization, claiming to receive 350 garbage containers. As regards electricity, al-Asyana area mentioned here is a part of Azaz that has suffered from a lack of electricity over long periods. In December 2014, the local council claimed to fix technical problems with the network for the area, including by extension of new cables, but the February statement suggests malfunctioning is still an issue. More generally, problems with electricity will have begun since the outbreak of unrest in Azaz in 2011 and become more acute since July 2012 when the town fell out of regime control. Electricity has since that time come almost wholly from private generators. The “Energy Ministry” that has provided the local council with some aid is that of the opposition-in-exile’s declared Syrian “interim government,” which has been hoping to supply electricity as a public service to rebel-held areas via connection with Turkey’s electricity grid using the town of Azaz as the main link. That said, there has been no sign of real progress on these plans thus far. The Syrian Promise Movement has provided a financial sum of $500 as simple aid (for month of February) from the movement to meet the guarantee of fuel for three primary schools in the town- the well-being of the primary schools have precedence since they have a large number of children whose bodies cannot bear the cold of winter. 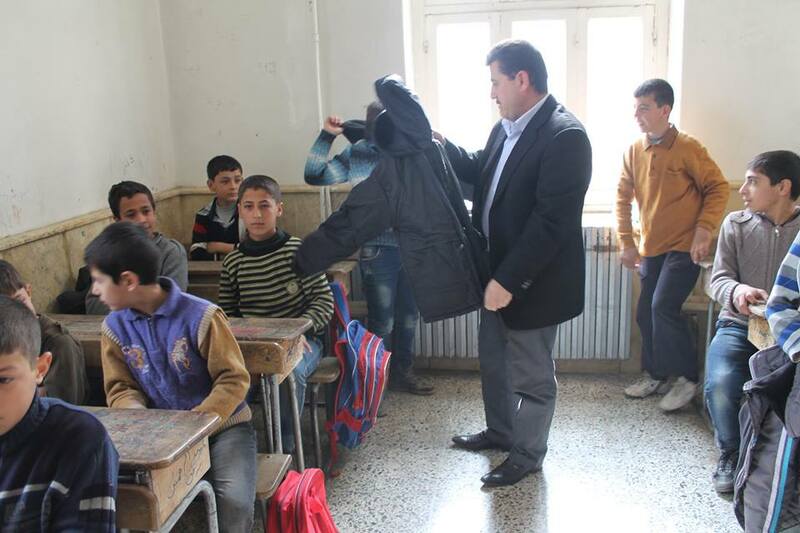 Initiative by Local Council in Azaz working with the Islamic Relief to provide winter clothing for children. On the plans to secure water, it is of interest to note the local council’s mention of the Midanki Dam, which is located in the Kurdish PYD autonomous canton of Afrin. Northern Storm and the PYD were once enemies, and tensions between the two sides meant that water, which before the civil war would come from the Midanki pumping station two days a week, was subsequently cut off. However, there was some limited cooperation of convenience in the fight to drive ISIS out of ISIS’ declared ‘Emirate of Azaz’ once wider infighting broke out between the rebels and ISIS in January 2014. Since Northern Storm returned to Azaz officially under the authority of Liwa al-Tawhid and the Islamic Front in Aleppo (now the Levant Front), there has been official neutrality despite suspicion that reinforcements come from Afrin to the regime-held Shi’a villages of Nubl and Zahara. Securing water from Afrin would therefore require greater outreach to the PYD, which may be one of the underlying reasons behind the agreement publicly announced in February between the PYD’s military wing the YPG and the Levant Front, stipulating a united judicial system, establishing joint Shari’a and da’wah offices in Aleppo and Afrin, and working together to crack down on crime. Of course, Jabhat al-Nusra is opposed to any such arrangements with the PYD/YPG, which it considers to be apostate entities. Provision of aid and vaccinations has also been advertised by the local council in Azaz. For example, in January, the local council’s aid office claimed to distribute 3500 packs of milk to locals, while also noting the problem of those not needing the milk but receiving distributions to sell for profit. On 24 February, a notification was put up for a polio vaccine campaign for children in Azaz running from 28 February to 5 March. This vaccine campaign was also advertised by the Azaz Media Centre that exists in a single room on the second floor of what was once a café, now otherwise abandoned. Perhaps more notable is the omission by the local council of mention of hospital services in Azaz, likely because the local council has no influence over such services that are private in nature. This similarly applies to the mention of only one bakery for which the local council provides flour, for it is public in nature whereas the other three bakeries in Azaz are privately run. In sum, it can be seen how the council wishes to present itself as an accountable body caring for local needs. Some sense of order has also been brought to the town particularly as Northern Storm is no longer an independent group but must answer to a higher rebel coalition authority (the Levant Front) if trouble arises. The opposition-in-exile, despite its unpopularity with locals on the ground in Azaz and more widely in Syria, maintains limited indirect influence in Azaz through its “interim government” provision of some aid. Yet by the local council’s own admission, resources are still highly strained, undoubtedly further pressured by the internal refugee influx into Azaz and the wider district. In comparison with direct Islamic State administration that spans significant contiguous territory and has greater financial revenues, the Azaz local council’s administrative system is much less complex and also suffers from the inherent problem of localization of rebel administration. Harper Says Canada Will Bomb ISIS In Syria If Murderous Despot Asks Him To. The decadence of occidental diplomats is worse than the Fall of Rome. Assad has infiltrated the Islamic State from day one with security men and moukhabarat operatives, if Assad did not create it from the bengining before it ever existed. Assad and Malki set free hundreds of dangerous islamists and sent them to Raqqa in the year 2013. All foreigners got by IS check points have been under real control of Assad men who got a lot of money in echange of liberation of their citizens from governments of countries like Spain, Turkey or Italy. Assad been buying oil to ISIL at very low cost and keeping and agreement of no agression while ISIL and Assad together destroyed the FSA. Hollywood productions are being produced by CIA -Iranian experts working side by side with Assad to create a state of horror around the world that eases the bombing campaing against IS and the end of the remnants of a revolution that have already been devorated by ISIL by the master hidden action of Iran-Assad-US cooperation. Now Syria is ready to belong to the New Persian Empire. Brave syrians are 90 % buried. Dirty people support the most violent sides without principles. Let the iranians show us how they manage the arab world under their feet. 16. Badr said: “Omen”, Does the US have the capacity to fix Syria after blowing Assad’s head off? If Russia and Iran would support a transition in Syria that forces Mr. Assad, his family, and the regime’s mafia from power; that includes Alawites, Sunnis, Christians, and Kurds in the new Syria; and that doesn’t open the door to further ISIS gains, the outcome could be fine. But if that doesn’t happen, and the U.S. comes to terms with Mr. Assad, then Washington will have achieved a horrible trifecta: legitimizing a mass murderer, feeding ISIS propaganda, and alienating its own Sunni allies. perhaps you have missed my point. how can a regime who continues to gas children be trusted to fix a damn thing? miller places reliance on russia and iran when they are waging a scorched earth policy. should be obvious to anyone that arsonists cannot be relied upon to be the savior. don’t infantilize syrians. they are perfectly capable of administrating their own country. russia & iran do not own syria & have no business interjecting control. shame on anyone for acceding to their insistence upon enslaving syria & treating the premise as perfectly reasonable. If Russia and Iran would support a transition in Syria that forces Mr. Assad, his family, and the regime’s mafia from power; that includes Alawites, Sunnis, Christians, and Kurds in the new Syria […] the outcome could be fine. i resent that implication that an outside power is need to secure these sects. we all know regime are not defenders of minorities and have even been found to be killing their own alawi supporters. badr, what miller fails to acknowledge is that he himself long argued against intervention. he sets up a “see, there’s no solution” scenario in order to justify his own idiocy. syria wouldn’t be a catastrophe it is today if there were early intervention. or if US had not obstructed to deny rebel access to heavy arms. instead, these brilliant pundits tried to distort logic by making it seem pefectly reasonable to allow a cancer to spread instead of acting early to cut it out. over 300,000 syrians slaughtered and all this ahole miller is interested in doing is placating his ego with a false “we cant do anything now” premise instead of acknowledging for having been wrong from the beginning. How come Saudi Arabia keeps popping up as a common denominator on Muslim terrorism around the world. A large majority of ISIS are Saudis. They have fomented much of the violence in Iraq. Some ally. They hate Iran. Do you notice which country is missing from the chart as supporters of ISIS? According to a study by the Brookings Institute dealing with a 20,000 sample size, Saudi Arabia is the top location claimed by Twitter users supporting ISIS in 2015. Syria follows and Iraq rounds off the top three. CIA and Iran did not create the Islamic State. Turkey, Saudi Arabia, and Qatar GOVERNMENTS helped create the Islamic State. The Islamic State is a %100 SUNNI group created by Sunnis for Sunni goals. Take care SYRIAN brother and have a wonderful day. Your argument is weak as always. Even though you are trying hard to prove you worth the salary they are paying you to drum for war in Syria. What you wrote is a collections on one liners…Twitter logic can not solve a complicated matter like the Syrian Crisis. You want war and violence to solve things so children stop getting killed. But how? According to you this should be done through violence. No, and one thousand NO…we saw and we see what is going on. Saving more children is going to happen ONLY through political settlements and nothing else. There is almost ZERO guarantee that violence is the right way to solve matters. History proves that political solutions had and will solve tens of very complicated civil wars. In your process, that is not guaranteed to succeed, from all sides many children are going to die. That is besides how many teen agers, women, old men, old women, destroying the country, destroying more infra structure…. When talking about geostrategy (and I guess this is our subject) Iran is not a God inspired islamic republic but a regional power that pretends to become the New Persian Empire under the patronage of US global empire. Do not cheat yourself or do it if you need to keep on believing your lies but do not try to cheat others. Thanks and take care ! AS some of you know, a Syrian army helicopter crashed in Idleb country side and 5 officers were captured. Aksalser posted a video of the captain, Yousef Najjar, which was released by the Nusra terrorists and the “moderate rebels” fighting under their flag (the FSA has no presence there except on facebook). The video ended up being an embarrassment after showing what type of people those rebels are and the language they use. Despite the beating, Yousef, who was executed later, refused to curse Bashar saying “it was not nice”, the terrorist who was beating him asked if he was Sunni and took his ID, and sure enough he was a Sunni from Homs/ Khaldiyyeh. you follow me on twitter, mj? that’s adorable. congratueffinlations, ghufran, assad killed another terrorist. is this where you praise glory to idol iran? After the US marines of Bush trying to invade Iraq now it is the turn of Iran to conquest the mesopotamian nation. Day after day it is clearer and clearer that US is delegating in Iran the dirty job of CONQUERING and HUMILIATING the Iraqi nation. ساهمت الثورات العربية التي تجتاح دول المنطقة والتحركات الشعبية المطالبة بالديمقراطية والحرية، في تسليط الأضواء على الواقع السياسي والاجتماعي والاقتصادي لهذه الدول. وأعادت الثورة السورية المستمرة منذ أكثر من ثلاث سنوات ذكرى الصراع الطائفي القديم على السلطة بين الطائفة العلوية التي تنتمي اليها عائلة الأسد، وبين الأكثرية السنية التي حكمت سوريا لعقود سابقة وتعتبر نفسها اليوم مهمشة ومضطهدة من نظام الأسد. هناك محاولة لتصوير الصراع الدائر في سوريا بأنه صراع طائفي ما بين الأقلية العلوية الحاكمة المتمثلة بنظام الأسد والحركات الأصولية التي تمثل الأكثرية السنية البلاد، وفي هذا اجتزاء لما يحدث وافتئات على الثورة وعلى أبناء الطائفة العلوية، التي يجري اليوم اختصارها بعائلة الأسد الحاكمة. من هنا الحاجة الى التعرف من كثب الى هذه الطائفة معتقداتها وأفكارها وتاريخها في المنطقة. أدى الطابع السري للديانة العلوية، وعدم وفرة الكتب التي تتحدث بوضوح عنها وتشرح معتقداتها، الى صعوبة التعرف عليها، لا سيما في ظل التشكيك بحقيقة انتساب هذه الطائفة الى الإسلام. ففي حين يشدد فقهاء الطائفة العلوية، ومعهم مؤرخون وباحثون، على أن “العلويين مسلمون، إماميون، جعفريون، يعتمدون الشريعة الإسلامية عقيدة لهم ويطبقون أحكامها، وفقاً لمذهب الإمام السادس أبي عبد الله جعفر الصادق”، فإن هناك من يعتبرهم هراطقة خارجين على الإسلام، مثل ابن تيمية (1263-1328) الذي أصدر فتوى كفّرهم فيها واعتبرهم من “أصناف القرامطة الباطنية وهم أكفر من اليهود والنصارى”. ومثل كل الأقليات عانى العلويون عبر تاريخهم الطويل الاضطهاد الديني من الحكام، مما دفعهم الى الانغلاق داخل مجتمعهم والانسحاب للعيش في سلسلة الجبال الممتدة من عكار جنوباً الى طوروس شمالاً. ويعيش القسم الأكبر من العلويين اليوم في تركيا وسوريا، كما يتوزعون في العراق وفلسطين، بالاضافة الى وجودهم في الولايات المتحدة ودول الاتحاد الأوروبي.
. وظلت هذه التسمية تطلق عليهم حتى السنة 1920، حين قام الفرنسيون أيام الانتداب بتغيير إسمهم الى العلويين لتمييزهم عن النصارى، أوالمسيحيين. يتفق العلويون مع الشيعة عامة بالرواية التاريخية لمرحلة الرسول وما بعدها، لكنهم يختلفون في النظريات الدينية والتفاسير القرآنية، ويزعمون قدرتهم على معرفة الحقيقة بالتواتر عن الأئمة المعصومين. وأكثر ما يركز عليه العلويون هو العقل الذي يرمز عندهم الى الرسول. وهم مثل الشيعة يعطون مكانة كبيرة للإمام علي، لكنهم يختلفون عنهم بأن بعض غلاتهم يقدسون علياً ويرفعونه الى درجة الألوهة. وأكثر ما يختلف به العلويون عن السنة والشيعة في آن معاً هو إيمانهم بالثالوث المقدس الذي يتجلى بسحبهم في: الله – محمد – علي. مما يقربهم من فكرة الثالوث المقدس عند المسيحيين. كما يعتقد العلويون بنظرية الحلولية الإلهية، وبأن الله يتجلى في صورة الإنسان وقد تجلى في النبي محمد والإمام علي وعدد من الأئمة والصالحين والأشخاص الذي يختارهم الله من هنا ظهور شخصيات في التاريخ العلوي ادعوا النبؤة وآمنوا بالإمام المنتظر. تقوم الديانة العلوية على الايمان بنظرية التقمص، أو التناسخ، الأمر الذي يقربهم من أبناء الطائفة الدرزية. وللعلويين موقف خاص من تطبيق أركان الإسلام الخمسة، فكونهم من أصحاب الاعتقاد بالظاهر والباطن، ويرون أن روح العبادات ليست سلوكاً خارجياً ينفذه الانسان بعناية وتكرار، وأن بواطن الأمور تمكن معرفتها من خلال الأئمة المعصومين، وأن الله يعطي هذه المعرفة لمن يشاء من عباده الذين يتصفون بالبصيرة والعقل، فهم لا يعتبرون الصيام في شهر رمضان أمراً ملزماً. أما الصلاة فلا ضرورة لإقامتها في المساجد، ويمكن أن تجري في منازل وأماكن خاصة. ويدافع العلويون عن عدم تشييدهم المساجد كونها لم تكن موجودة أيام الرسول والإمام علي، ولأن علياً قتل داخل المسجد. ولا يحّرم العلويون شرب الخمر، مما يجعلهم يشبهون، بالاضافة الى أمور أخرى، المسيحيين. وقد دفعت أوجه الشبه بين العلويين والمسيحيين المستشرق البلجيكي هنري لامنس(1862-1937) الى كتابة في بحث له بعنوان “هل العلويون مسيحيون؟” “العلويون هم من المسيحيين الذين أخفوا ديانتهم وادعوا أنهم مسلمون كي لا يتعرضوا للاضطهاد الديني”. وثمة تشابه آخر ما بين العلويين والدروز في سرية التعليم الديني. فبالاستناد الى رسالة الدكتوراه التي أعدتها فابريس بلانش عن الموضوع عندما يبلغ الفتى العلوي سن المراهقة يقوم والده بتعريفه على شيخ يطلعه على أسرار الدين، ويصبح هذا الشيخ الأب الروحي للتلميذ. ويدين له بالطاعة حتى الموت. لكن ليس كل أبناء الطائفة يحق لهم التعرف على ديانتهم، من هنا يقسم الناس الى قسمين: العالمون بالدين والجاهلون به. لا يفرض العلويون الحجاب على المرأة لأنه ليس فريضة إسلامية ولكنه نوع من الحشمة المحببة. ولكن لا يحق للمرأة الاطلاع على أسرار الدين، ورغم الدور المهم الذي كانت تقوم به في مجتمع الريف فإن هذا لا يعطيها حقوقاً، وهي أقل مرتبة من الرجل. في رأي المستشرق الفرنسي لويس ماسينيون (1883- 1963) إن الديانة العلوية هي مزيج من الإسلام المتأثر بالديانة المسيحية والديانة الغنوصية المشرقية القديمة (تيار عقائدي ذو فلسفة حلولية نشأ في القرن الأول الميلادي وحاربته الكنيسة المسيحية) والتيارات الصوفية. كا يبرز تأثر الديانة العلوية أيضاً بالمعتقدات الفارسية القديمة. ويحتفل العلويون بعيد الميلاد والغطاس، بالاضافة الى احيائهم لعاشوراء واحتفالهم بعيدي الفطر والأضحى. يعيش في تركيا اليوم ما بين 20 الى 23 مليون علوي، نحو 35 في المئة منهم من الأكراد، وهناك أيضاً علويون تركمان، ويتوزع هؤلاء في صورة خاصة في داخل الأناضول وفي غربه وبالقرب من البحر الأسود. هناك اختلاف ما بين العلويين في تركيا والعلويين في سوريا. فالعلوية التركية تعود الى الفرقة الصوفية القزلباشية (ذوو الطاقيات الحمر) التي نشأت في القرن السادس عشر في أذربيجان وانتشرت في جنوب تركيا، ومنها نشأت الدولة الصفوية، ومن الفرقة الصوفية البكتاشية (طريقة صوفية شيعية المنشأ نسبة الى الشيخ بكتاش المتوفي السنة 1336). أما العلوية في سوريا فأقدم من ذلك بقرون عدة. لكن القاسم المشترك ما بين العلويين في تركيا وسوريا معاناتهم الكبيرة من الاضطهاد الديني أيام السطنة العثمانية. من هنا رأى العلويون في تركيا في مجيء أتاتورك الى الحكم الذي عمل على علمنة الدولة، خشبة خلاص لهم. وبدءاً من النصف الثاني من القرن العشرين دخل العلويون في نسيج الدولة والمجتمع، وأخذت غالبيتهم تؤيد الأحزاب العلمانية. ولوحظ أنه منذ مجيء حزب العدالة والتنمية الى الحكم عاد العلويون الى ممارسة شعائرهم الدينية بحرية أكبر، وبدأت مطالبتهم بتمثيل أكثر عدالة في وظائف الدولة، لا سيما الحساسة منها. لكن اجمالاً يظهر العلويون باختلاف انتماءاتهم العرقية منسجمين ومندمجين داخل نسيج الدولة والمجتمع التركيين. هم أقدم العلويين في المنطقة تاريخياً، ويشكلون اليوم الطائفة الأكبر في سوريا بعد السنة ويبلغ حجمهم 13 في المئة من تعداد الشعب السوري. مرّ العلويون السوريون بمراحل طويلة من الاضطهاد أيام السلطنة العثمانية، التي لم تعترف بهم كمسلمين وفرضت عليهم الجزية بدءاً من السنة 1571، لأنهم لا يصلون في المساجد ولا يؤدون الفرائض الإسلامية، ومنعتهم عن ممارسة أي شعائر خاصة بهم. هذا الأمر أجج مشاعر الكراهية لدى العلويين ضد السنة، ودفعهم الى التخندق داخل منطقة الجبال والانغلاق على أنفسهم. وقد ثار العلويون غير مرة ضد العثمانيين في 1806 و1811 و1852. ولم يتحسن الوضع إلا مع نهاية القرن التاسع عشر، عندما قام العثمانيون ببعض الإصلاحات ومنحوهم شيئاً من الاستقلال الذاتي. شكل مجيء الانتداب الفرنسي مرحلة جديدة في تاريخ العلويين لأنه حررهم من اضطهاد العثمانيين، ولأن السلطات الفرنسية وافقت على منحهم الاستقلال الذاتي. فأعلن في تموز 1922 عن قيام الدولة العلوية في اللاذقية. وصدر قرار بالغاء الضرائب المفروضة على العلويين وانهاء عمل المحاكم السنية ونقل صلاحياتها الى قضاة علويين. وقد ساعد هذا كله في تغيير وضع العلويين بصورة كبيرة وأدى الى بداية نهضة هذه الطائفة. في المقابل تعاون هؤلاء مع السلطات الفرنسية وشاركوا في فرقها العسكرية وخدموا في جهاز الشرطة والاستخبارات. لكن هذا لم يمنع من نشوب ثورات ضد الفرنسيين، أبرزها ثورة الشيخ صالح العلي الذي أعلن العصيان على الفرنسيين في نهاية 1918 وقاتلهم حتى 1921. لكن مخاوف العلويين تجددت مع انتهاء الانتداب الفرنسي والاعلان عن استقلال سوريا والغاء الدولة العلوية في كانون الأول السنة 1936. وبرزت المقاومة العلوية للحكم السني في ثورة سليمان المرشد السنة 1939 و1946 وثورة ابنه 1952. تعتبر الحقبة الزمنية ما بين 1946-1963 فترة السيطرة السنية على الحكم في سوريا، وبدء اندماج الطائفة العلوية بالدولة وصعودها. والمفارقة هنا أن تخلي العلويين عن توجهاتهم الانفصالية وانضواءهم الى الدولة شكلا بداية مرحلة نهوضهم الحقيقي. فمنذ وصولهم الى الحكم بذل السنّة جهوداً كبيرة لدمج العلويين في كيان الدولة القومية، لاسيما ان اللاذقية كانت تشكل أهم منفذ للدولة على البحر. وقد ألغى هؤلاء الفرق العسكرية العلوية ودمجوها بالجيش الوطني. وعندما أيقن العلويون أن مصيرهم بات مربوطاً بمستقبل سوريا الجديدة بدأ سعيهم الى السلطة من خلال طريقين: الجيش وحزب البعث. ابتعد أبناء الطائفة السنية من الجيش لأسباب ثلاثة، هي كره النخبة السنية للحياة العسكرية، ومحاولة السياسيين تقليص دور الجيش في الحياة السياسية، وعدم قدرة أبناء الأقليات بصورة عامة على دفع بدل مالي لإعفائهم من الخدمة العسكرية، في المقابل رأى العلويون في الجيش فرصة للإرتقاء الاجتماعي وللخروج من حياة الريف الفقير والدخول في حياة المدن السورية، ناهيك عما يقدمه الجيش من حياة لائقة بالمقارنة مع ظروف حياتهم الصعبة. في السنة 1949 شكل العلويون أكثرية الجنود في الجيش وثلثي الضباط، وكان القادة العسكريون من السنة يعتقدون أنهم باحتكارهم المناصب الرفيعة في الجيش، يستطيعون السيطرة عليه. لكن الصراع على السلطة ما بين الضباط السنة والانقلابات العسكرية التي كانت تؤدي الى الغاء بعضهم البعض ساهمت بصورة كبيرة في تعزيز مواقع العلويين الذين بقوا موحدين داخل الجيش. أدت حقبة الانقلابات العسكرية والصراعات داخل السنة في الجيش وخوفهم من الخيانات الى اعتماد بعض هؤلاء على ولاء الضباط من الأقليات في الجيش، الأمر الذي عزز من جديد موقع الضباط العلويين، بالاضافة الى أن السنة كانوا يدخلون الجيش كأفراد، اما العلويون فكانوا يدخلونه كجماعة متضامنة. أما العامل الثاني الذي ساهم كثيراً في صعود الطائفة العلوية فهو حزب البعث الذي جذب بأفكاره العلمانية الاشتراكية جموع العلويين من الفلاحين وأهالي الأرياف الذين عانوا من التمييز وكانوا يعيشون في حال من الفقر المدقع. كما ساهمت هجرة أهل الريف الى المدن في تعزيز هذه الظاهرة، اضافة الى انتقال أبناء الريف الى المدن للدراسة. فانضم العلويون بأعداد كبيرة الى صفوف حزب البعث، لا سيما في فرع الحزب في اللاذقية وفي فروع جامعتي دمشق وحلب. لعب العلويون دوراً مهماً في انقلاب آذار السنة 1963، وتولوا مناصب حساسة في النظام، كما قاموا بانقلاب 1966، لكن نفوذهم تجلى مع الانقلاب الذي قام به الرئيس حافظ الأسد السنة 1973، والذي شكل بداية حكم عائلة الأسد التي من خلاله ضمنت استمرار سيطرة الطائفة العلوية على الحكم حتى اليوم. ويذكر أن الرئيس حافظ الأسد طلب من الإمام موسى الصدر رئيس المجلس الشيعي الأعلى في لبنان اصدار فتوى تقول ان العلويين هم من الشيعة، وذلك لإسكات المعارضين لانتخابه رئيساً للجمهورية، بحجة ان الدستور يفرض أن يكون الرئيس مسلماً. وقد أصدر الإمام هذه الفتوى في السنة 1974. يقول باتريك سيل في كتابه “الصراع على الشرق الأوسط”: “اصدار هذه الفتوى أزال العقبة الأخيرة التي كانت تعترض طريق حافظ الأسد الى الرئاسة”. ويواجه النظام في سوريا اليوم أكبر تحد داخلي بدأ يزعزع سيطرته شبه المطلقة على الحياة السياسية في سوريا، وذلك في مواجهة مطالبة مكونات أخرى في المجتمع السوري بالتخلص من نظام الحزب الواحد وقيام نظام سياسي تعددي جديد يضمن اجراء انتخابات حرة تمثل بصورة حقيقية ما آال اليه المجتمع السوري اليوم وتعكس تطلعاته نحو حياة سياسية حرة وعادلة. وفق التقديرات يعيش في أوروبا أكثر من مليوني علوي. ويقطن العدد الأكبر منهم ألمانيا حيث يبلغ عددهم 600 ألف شخص. وهناك نحو 150 ألف آخرين في فرنسا. وقد اعترفت السلطات في النمسا رسمياً في العام الماضي بهم كطائفة دينية مستقلة، ويبلغ عدد العلويين هناك نحو 60 ألف شخص. Now that, in cooperation with the Obama Administration, Assad and Iran are the new masters of the Middle East the pressure is on you, on all supporters of Assad, on Iran´s Ayatollahs, on Obama´s politics results on the short and on the long term. It will not be enough to ethnic cleanse the arab sunnis from Syria, Iraq and Iemen, it will not be enough to let christians leave (through the puppet of IS working for Iran and US interests). Iran and US will have to prove how they can control, rebuild and regenerate a land burned, devastated countries, social and human landscapes never seen after the WWII. Good luck, keep on killing people, so your future will be brighter. Are you Homsi? Did not the masters of the Middle East are your favorite Hamad Ibn Khriyan and Saud Aldharttan and Recep Tayyip Khoziyan with Nabil Al-Sohiouny and a little grimy from the European and American kitchen! Enough cry. Does the lack of arguments let you spit non-sense sentences ? Do not forget your pills tonight. You will feel better tomorrow. In sha allah. قال هيثم المالح، رئيس اللجنة القانونية للائتلاف السوري المعارض، إنهم لم يتلقوا دعوة حتى الآن من القاهرة لحضور مؤتمر القمة العربية التي تنطلق السبت المقبل. America’s closest allies support ISIS. And admittedly, the U.S. has repeatedly fumbled, so that arms got into Al Qaeda and ISIS’ hands. Here, here, here, here, here and here. In November 2010 the John F. Kennedy Special Warfare Center and School at Ft. Bragg, North Carolina, would publish Training Circular TC 18-01 entitled “Special Forces Unconventional Warfare”. The TC 18-01 was published for use by U.S. Special Forces as well as by “contractors”. The circular contains a destruction notice stating “Destroy by any method that will prevent disclosure of contents or reconstruction of the document”. The document is “releasable to students from foreign countries on a case-by case basis only”. The document states that the United States, for the foreseeable future, would primarily be engaged in unconventional warfare. The document contains a structured approach to the subversion of targeted nation States, beginning with an assessment of a feasible and cooperative opposition, the creation of events to polarize society, the establishment of armed groups and their development into a fighting force that is capable of fighting a civil war or unconventional war under U.S. supervision to achieve U.S. foreign policy goals. The TC 18-01 contains a de-facto blueprint for the United States’ and NATO’s involvement in Libya and Syria under the command of NATO SACEUR Stavridis. The TC 18-01 also represents a precise blueprint of the ongoing war in Iraq and the “crisis” in Ukraine. Sadly, it was impossible to reach out to James G. Stavridis via the Fletcher School at Tuffs University. Ivo H. Daalder and James G. Stavridis would co-author an article entitled “NATO’s Victory in Libya. The Right Way to Run an Intervention”. The article about NATO, overstepping the provisions of UN Security Council Resolution 1973 (2011) was published in Foreign Affairs, March/April 2012, pp 2 – 7. During NATO’s 25th Summit in Chicago in 2012, NATO would adopt the premises of this article as part of NATO’s strategic doctrine. The Islamic State has released numerous photos of its snipers in training — and they appear to be using mostly old Russian-made Dragunov rifles that American troops have faced for years in Iraq and Afghanistan. have a look at this baby’s hand. It seems all hell is breaking loose in Syria this evening. Seems like big things are happening in Idlib right now. Also in Busra al Sham in the South. I’m trying to follow developments especially at EA Worldview comment section in the latest article. There’s even mention of ISIS (terrorist anti-revolutionaries) controlling a prison (Palmyra) and besieging the nearby Tadmur air base. Where the hell is General Zahreddine? For that matter where is Colonel Sohail and his ‘Tiger Forces’? Where is Abu Izrael when the regime needs him…? 51% of readers of SOHR web site consider the terror group Nusra an essential part of the so called “revolution” !! You can tell what type of a revolution those people want. this just awful. there are almost a million dead but the world doesn’t know because it’s being mislead by a regime mole in SOHR! Oula A. Alrifai: Assad has killed almost a million Syrians now, not 200,000 as the media is circulating! What can one conclude from this post by Aymenn Jawad Al-Tamimi? After several years of civil war, and with injections of foreign aid, people in Azaz can organize municipal services somewhat inferior to what the Ba’athist regime was able to provide, without foreign aid, before the war. Jordan was, is and will remain in the american-israeli-saudi axis. From The other side there are contacts between jordan and iran : king abdallah sent a nouroz greeting to khamenei and jordan foreign minister visited tehran. Iraqi politicians ( hakim ) visted jordan. To me this means nothing. The hashemite family in jordan has a long history of loyalty to israel It also has similar history of opportunism. They are thinking , what the hell if we can get some money oil and gas from iraq and iran. All they have to for is train some iraqi military and tell iran some lies about the mirage muslim unity. King abdallah was the first to talk about the ” shia crescent” and its supposed danger to the arab and sunni communities. Jordan continues to be involved in training , arming and leading the mercenaries in southern syria. The last attack on busra sham, still ongoing is planned and coordinated by jordan. The Al-Nusrah has many Joradanians that are also present in leadership postions. Many of these Joranians are planted there by Jordan’s intelligence services. At a time when the US seems to softening its position on Syria and the removal of President Assad, both Russia and the US have become increasingly suspicious of Israeli interference in their domestic political affairs. Part and parcel to this, as an adjunct to the seemingly endless stream of press hoaxes, Syrian “no fly zones” or the missile attack on MH17, is that other trail, arms to ISIS, jihadists on a “magic carpet” to Mosul and, of course, Wikipedia and the “Tel Aviv troll brigade,” all telling the same story. The trail leads to Israel. 27. Roland said: What can one conclude from this post by Aymenn Jawad Al-Tamimi? This: After several years of civil war, and with injections of foreign aid, people in Azaz can organize municipal services somewhat inferior to what the Ba’athist regime was able to provide, without foreign aid, before the war. let’s see how well you can organize being carpet bombed daily by assad – on top of being hunted down by his mercs undercover. Obama’s policy in Syria has failed? US planning in Syria has failed? Do you have any business to do, except the dirty intervention in the life of other nations and peoples? I hope I don’t jinx matters however I’d like to give a mention to the NC leader Mr Khaled Khoja. Under his leadership/watch the revolution has seen the recent flurry of successes and forward momentum. Mr Khoja is leading, potentially, a period of transition from stalemate to sustained revolutionary offense on multiple fronts. Maybe it’s the Turkmen touch. The sterile coalition headed by khoja is now irrelevant and is a mere extension of the Turkish Muslim brotherhood government in Ankara. The once breathing FSA is now only available on Facebook, nusra terror groups and semi- nusra variations have taken the lead on the ground which effectively transformed the rebel force into a terrorist organization. Assad and his inner circle did not want an acceptable and a moderate armed group to be a potential future negotiating partner (what NATO wanted ) to prepare the ground for a regime change, this strategy helped Assad and his supporters but that is not what many of us wanted. Assad’s failure to act as a president for all Syrians and his determination to keep things as is in his government (and his army and security forces) may have secured him a seat in future negotiations but it also prolonged the war and alienated many syrians, he instead allowed his security chiefs to arrest everybody who disagreed with his policies including people who were not involved in violence. Pakistanis, israelis and other foreign characters who write on this blog drumming for war are a mix of Islamists and pro Israel dwarfs, very few care about the future of Syria and most did not understand (or wanted to see ) why the country will be better off with one army ( as bad as it may be) instead of having multiple armed groups that will only succeed in destroying any hope for a revival of the Syrian state. The lessons of Libya are written all over the walls but those lessons are not powerful enough to defeat the hatred that characterizes Wahhabis and zionists. After all, you can not fix stupid. Will intervention in Yemen lead to intervention in Syria? Success in Yemen will only increase the self confidence of Saudi and co. Also remember Turkey would most likely join an intervening alliance in Syria. With world attention increasingly on the developing Yemen situation watch out for Assad regime seeing it as an ideal opportunity to do some illegal move (use of a banned weapon or chlorine on a larger scale, carry out a massacre etc) to gain an extra advantage and hope to get away with it. I wouldn’t put it past the regime. The world is distracted by the horrific plane crash in Europe and the Military intervention in Syria. The revolution must be careful and the world must keep one eye on Syria and other hotspots (eg Ukraine). Do you think the aggression on states is a drink of water? Will be the end of the Abdul Wahab Al-Saud and there in Yemen in Anatolia Cemetery!!! Dear Mr. Putin: There is a need to restrain and break the backbone of the Kingdom of Saudi Arabia because of the criminal act and aggression on Yemen. Did not do it America with Saddam Hussein when he invaded Kuwait? If the Gulf are slaves to the petrodollar, what does that make Putin? I read elsewhere (on a forum) about Turkey, Saudi and Egypt sitting together in Riyadh in recent weeks during the comings and goings and flurry of meetings. There was optimistic claims/speculation about Turkey and Egypt putting their issues behind them. After all Turkey was pro- Morsi. Now these two nations are or will be working together in Yemen. It may not appear good for Turkey’s reputation to look disloyal to it’s allies and as a flip-flop but as someone speculated perhaps the payoff for this may have been an agreement/promise to deal with the Assad regime in the near future. Maybe this current united and powerful alliance will go after Assad very soon. Sami, are you comparing one of the most powerful countries in the world with a camels? Whatever “International standards” Russia has achieved, ain’t much of it to be proud of. Unless empowering criminals, oligarchs, and thieves is considered a “standard”. And let’s be honest here, Russia is a former super power and is punching way above its weight and it shows. Economy in shambles, one of the worlds worst income disparity, crime and corruption at an all time high, opposition leaders either killed or jailed to silence them, and a tzar who would rather spend billions on filling his pocket along with his cronies and then whatever they can’t fit they spend on building arenas and stadiums and host international events for the “prestige”, than help the poor and diversify the economy. Hell, Ukraine is turning into a graveyard for Russian soldiers because idiot Putin wants to expand the “prestige” and “international standards” of mother Russia. Well that mother has turned into a old decrepit babushka which is turning increasingly cranky as time goes by her. it is a virtual certainty that the US will intervene at a point in the near future, with its own military assets. So while we await to see just where US troops make landfall, Keep a very close eye on the LHD-7 Iwo Jima amphibious assault ship (which carries some 2,000 marines of the 24th Marine Expeditionary Unit), currently located just off the coast of Yemen. Assad probably showing his unhappy base he’s trying to do something. The two warships, the USS Iwo Jima and the USS Fort McHenry in the Red Sea may to be attacked by Israeli Dolphin submarines to claim Iran did it (a repeat of the USS Liberty gambit) and the war with Iran will be underway! They would back the Devil himself to achieve their hegemonic ambitions in the region. The Saudis think they can do anything, who can blame them, the Saudi family own a country, with all the oil wealth to buy other countries allegiance. The Saudis are funneling billions into Egypt and are now buying mercenaries from Pakistan. Where will it all end? Hopefully with all the Kings and Emirs dangling from mosque minarets. An interesting comparison between Assad and Kadyrov (Chechnya). Kadyrov likes to invite leading celebrities, actors and pop stars to boost his profile whilst Assad invites Z-list western ‘politicians’ (usually far-right figures). The other day a Belgian Far-Right delegation led by Filip Dewinter was over in Damascus. Nick Griffin (UK) is a previous example. Did you really think Saudi Arabia and Israel would stay quiet while Iran expands its imperial aspirations all around the Middle East? Take this and get ready. Now Obama the intellectual arrogant will be obligued to decide who he is siding. Egypt has entered the arena of dance prostitutes again, it seems that the Egyptians did not digest well the lessons. This article about the Massive Underground Project shows how Putin and his mafia have a great psicological problem and inferiority complex due to impotency which at the same time is caused by excessive consupmtion of vodka. The only positive aspect of the Massive Monumental Incredible Tremendous Masculine Superman Project of Putain is that they will find a place to hide in comfort underground like the rats they are. The Houthis terrorist organization paid by Iran will start now a process of terrorist activity against anyone supporting the legal president of Yemen. But at the same time they will play the victim as the chiite and specially Iran is use to do. And here is the main contradiction that makes the Iranian Project impossible, you cannot play the victim and be the master of the Middle East at the same time. Iran should think about invading Mongolia instead of the Middle East. Pindoses-maldevelopment. here scored on you fat large bolt with big head! if you are tired of living, then knocks on the door and guaranteed special voucher to the Mars.